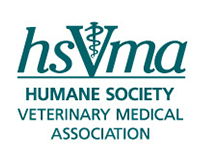 The Humane Society Veterinary Medical Association (HSVMA) reaches out to thousands of veterinary students every year with our animal welfare-oriented, on-campus activities and field service training opportunities that give students the opportunity to expand their skills and assist animals in need. Western Univ. SCHSVMA members take a break during their annual volunteer day at a local sanctuary. Connect students concerned about animal welfare in the veterinary community to like-minded students. Provide opportunities for students to get involved in animal protection issues and direct care programs. Offer advice and financial assistance to promote humane methods in veterinary education, such as Educational Memorial Programs and partnering with local animal shelters for humane surgical training programs. Since 2008, HSVMA and the Kislak Family Fund has provided financial support to the University of Florida’s HAARTS program (Helping Alachua's Animals Requiring Treatment and Surgery), which provides life-saving medical care to local shelter animals and low-income caregivers while providing veterinary students surgical training opportunities to develop skills in procedures they will typically encounter in private practice. HSVMA provides financial support to it’s student chapters for World Spay Day events. Students examining a cat during a RAVS clinic. RAVS combines high quality direct-care veterinary field clinics with clinical training for future veterinary professionals to improve the health and welfare of animals in remote rural communities. Our professional teaching programs include hands-on training for veterinary and veterinary technician students in medicine and surgery as well as community education and recognition of animal health problems in economically disadvantaged populations. Each year more than 250 veterinary students participate in our field programs. Veterinary students from over 30 universities throughout the United States, Canada, Latin America and the U.K. have participated in clinics operated by the RAVS program. Many of these institutions offer academic credit for participation. 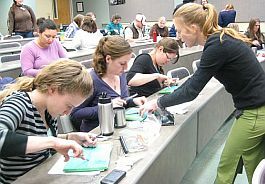 A Washington State veterinary student receives individual instruction at an HSVMA suture lab. 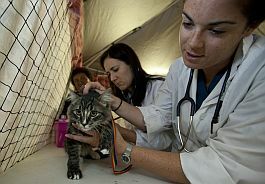 Veterinary professionals come to veterinary schools to speak about animal welfare topics, such as veterinary involvement in reporting animal cruelty, feral cat overpopulation, early-age sterilization and puppy mills. HSVMA student chapters also have special access to hands-on training through our suture labs.